Smaller and Smaller Circles is not your typical Filipino film. It’s a film of many firsts and rarities. Far from the romantic-comedy movies that are the usual offering in Philippine cinema these days, Smaller and Smaller Circles has the kind of story that we see in Hollywood films: a could-be serial killer murdering and eviscerating young boys. Enter the Pinoy twist: the bodies are found in the garbage and poverty-stricken slums of Payatas. The country’s FBI equivalent – the NBI – seeks help from Jesuit priests Father Gus Saenz (Nonie Buencamino), who is a forensic anthropologist, and his protégé Father Jerome Lucero (Sid Lucero). 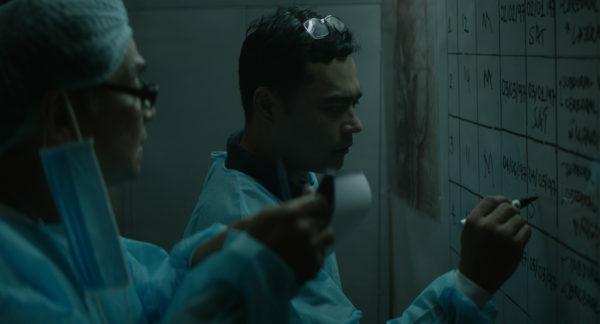 To solve the murders, they must search for the murderer in the cramped urban landscape of 1990s Manila – “a trap where there is no way out for both the killer and his victims”. Jesuit priests Father Gus Saenz (left) and Father Jerome Lucero (right) tries to solve the series of child murders in Payatas. The movie is an adaptation of Filipino novel written by journalist F.H. Batacan, a source material that not a lot of local filmmakers turn to. Smaller and Smaller Circles is one – if not the pioneer – of this film type in the country. Coincidentally, the novel is Batacan’s first dive into fiction, which earned her a Carlos Palanca Memorial Award, a National Book Award, and a Madrigal Gonzales Award. The book’s themes and images are eerily relevant today, despite the novella version being written way back in 1997. The film’s producer Ria Limjap thinks it reflects recent events involving the series of deaths of young boys around Metro Manila. The Heneral Luna producer read the extended version of the novel in 2015 and Limjap was convinced that the book would be an excellent film material, just like what the film’s director Raya Martin felt when he read the original copy. “Napaka-cinematic kasi ng pagkakasulat ni Ichi (F.H.Bataan) ng Smaller and Smaller Circles. It really feels like a movie when you read it,” Martin said. Soon, Limjap and Martin developed proposals to acquire the rights of the book from its New York publisher, the Soho Press. It marked both their first time working on landing book rights and a novel-to-movie adaptation. As associate producer of Heneral Luna, Limjap said a principal book reference became the basis for further research (Tons of it!) for the storyline. With Smaller and Smaller Circles, however, the story is just ready to go to the big screen. For Martin, whose first mainstream movie will be Smaller and Smaller Circles, the cinematic quality of the novel has helped hugely in directing his creativity. He said he wanted to complement the book with truthfulness on the big screen. “The beauty of the book is that you can imagine certain worlds. That’s how powerful Ichi’s words are. Also at the same time, I wanted to share some things na natutunan ko from [reading] it,” Martin explained in an interview. He was honest, though, about his feelings on adapting the book to a movie for the very first time, sharing that it was frightening because the writer is someone he admired. Putting aside his usual experimental and art-house film sensibility was even more challenging, Martin shared, because the narrative in mainstream films required straightforward storytelling and attention to detail. The 33-year-old director also felt that doing mainstream films can help bring movies with more substance closer to the masses, especially those that tackle issues in religion, politics, class, among many others, by cleverly using the idea of a serial killer. After all, Martin has a reputable record for creating films in striking, Cannes Film Festival fashion. He was the first Filipino filmmaker to be selected as a resident at the prestigious Cinefondation Residence du Festival de Cannes straight out of UP Film Institute at the age of 21. “It satisfies ‘yung gusto kong paggawa ng horror na may dugo, gore, and serial killer ever since I was a kid and at the same time it talks about issues that we live with and see almost every day,” he explained. MB Life managed to get some hints from one of the year’s most anticipated film from the director. Martin revealed that the first half will be familiar, as was written in the book. The second half, however, will be different from the rest. “They need to watch the movie. It’s not a copy of the book. It’s a different way of looking at the book and we really tried our best to present something that’s different from the book,” he explained. The film, in essence, also invites the viewers to delve deeper and find out why “we [always] end up with the same issues almost two decades later”. “It’s also the urgency of the book eh kasi gustong-gusto namin what it says,” he added. It is a message of compassion, hope, and change. “Let’s not forget na there’s always a light at the end of the tunnel and always, if there’s a problem, there’s a solution. If you’re looking for something or someone, you’ll always find it in the end,” Martin concluded. Smaller and Smaller Circles — which will be out in cinemas nationawide on December 6 – also stars Carla Humphries, Bembol Roco, Christopher de Leon, TJ Trinidad, Raffy Tejada, Ricky Davao, Roselyn Perez, Jess Mendoza, Bong Cabrera, Gladys Reyes, Madeleine Nicolas, Ross Pesigan, Junjun Quintana, Alex Medina and Cholo Barreto.